These newel caps and half newel caps have a simple flat, square design, to produce neat, clean lines and give a tidy finish to your square newel posts. These square newel caps are made of metal with a black finish that will contrast beautifully with natural timber newels or newel posts that have been painted. 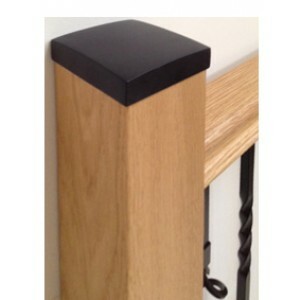 These newel caps would particularly suit staircases with metal spindles that also have a black finish. These flat newel caps will suit standard size 90mm x 90mm square newel posts, and the half newel caps suit 90mm x 45mm half newel posts, which are often used when a handrail finishes against a wall.